Thank you to our fabulous entertainers! Check out our beautiful new brochures! 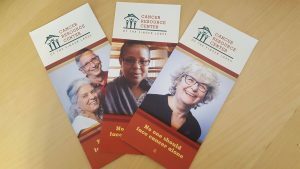 We’re looking for volunteers to help us distribute them to local agencies, town halls, and libraries throughout Tompkins County. If you’re interested, please contact Fran at 277-0960 or fran@crcfl.net. CRC will be hosting its first Fashion Show Gala featuring cancer survivors as models on Sunday April 9th from 4-6pm at the Kitchen Theater. This premiere event will celebrate the strength, beauty, and diversity of survivors while creating community awareness about CRCFL. We are looking for both models and volunteers to help with the event. Saturday, October 1 at 4pm After three years of work, our Healing Garden is complete! Please join us at a Dedication Celebration to thank the many people involved – our donors, our volunteers, and especially Lee Ginenthal whose vision and hard work truly made it happen. Photos of the entire project in next month’s E-News. The Ithaca Women’s Volleyball Team is volunteered at CRC; painting, weeding, cleaning, and writing cards to some of our clients. to our wonderful intern, Salem Argaw, for all her hard work this summer! We’ll miss her at the office, but look forward to her continued presence at CMC. Salem’s warm smile and kindness are truly a welcome comfort for cancer patients in the infusion lab. Leon Ginenthal was recognized earlier this week by Tompkins Trust Company with the James J. Byrne Award for Excellence for the amazing work he’s done in transforming the backyard of the Cancer Resource Center of the Finger Lakes into a beautiful, healing space. Love to shop? We need your help! Paulette Salmon organizing wigs in our Boutique.